We've become fans of wing-shaped tarps for kayak and camping trips. They offer protection if you have to set up a tent in the rain, a covered but ventilated place for cooking, and an option outside the tent if you're stuck on land waiting for a storm to pass. 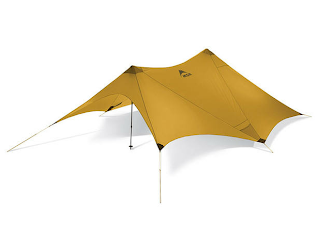 Awing tarp requires fewer poles than a square tarp, sheds water efficiently and holds up well in the wind. We've been impressed by the MSR Zing when we've seen it used with large groups, but at nearly seven pounds and 28 by 6 inches (packed), and a price tag of $400, that's more than we need for a four-person trip. So we were pleased to meet its kid sister, the Twing. Smaller (8 by 6 inches) and lighter (2 1/4 pounds), it can be pitched with support from spare paddles and provide the kind of protection we need. Back in its bag, the Twing is small and light. And as with all equipment for a trip, it's a good idea to practice using it before it's actually needed. We found the Twing quick and easy to set up, take down and repack. Adding additional guylines made it exceptionally sturdy. We've begun collecting and preparing food and gear for a 12-day trip this August along the Pukaskwa coast and Superior Highlands--a journey of about 120 miles as the crow flies, but longer if you hug the shoreline and explore coves and islands. We're planning to take the trip slowly, documenting the area and enjoying detours on land and on water. We don't want to bring anything along that we haven't tested. So we've been dehydrating food and tasting it; outfitting boats and paddling them; and favoring tried-and-true gear over unfamiliar items. That said, this trip calls for some things we've never needed before. So over the course of the next month or so, we'll blog about what we've learned. As we planned our menu, we realized we needed some kind of milk to go on breakfast dishes. (Our breakfast menu rotates between steel-cut oats, quick-cooking quinoa, and muesli.) It would be possible to do without milk, but we'll be far happier in the morning's with it. We aren't fans of dried cow's milk, so we prowled around online for a soy milk that gets good consumer reviews. We settled on Better Than Milk Soy and ordered two canisters that make eight quarts apiece. This tofu-based dried soy milk calls for 2 Tbsp. of powder for each cup of water. We tested it this morning. It's tasty and has enough body to hold up on cereal and in cocoa and coffee. This one is coming along. Alec tests the reconstituted milk on breakfast cereal. We've already made a few batches of tofu jerky, based on a recipe shared with us by Sue Gjerset of Minnesota, who has participated in courses each of us has taught. It's phenomenal--a great, high-protein snack and lunch item--and we plan to make several more batches before we leave. Drain and pat dry the tofu. Take the cube, cut it in half, and then slice it into strips on its short side about ¼ inch in thickness. Mix all the marinade ingredients together well. Put the tofu in a single layer in a shallow baking pan or cookie sheet and pour the marinade over it. Let soak for several hours or overnight. Drain excess liquid and dry tofuin food dehydrator or warm (200 degrees F) oven. This will take 4 to 8 hours, depending on weather. Dry the jerkyuntil it is very chewy, but not crispy. Be creative: Use Tabasco or ground cayenne if you want it hot. Chili powder makes chili jerky. Oregano and basil make pizza jerky. Originally we thought we'd prepare most of our food in advance, but with limited time and a lot of other things to do, we've decided to rely heavily on purchased prepared meals. We've ordered several entrees from Outdoor Herbivore, a company that specialize in vegetarian backpacking food, and we've stocked up on Fantastic World Foods instant refried beans, taco filling mix and other quick-to-prepare items. (We're limiting cooking time on everything we bring to 10 minutes in order to conserve fuel.) And although we dehydrated our own mashed sweet potatoes and we plan to dehydrate other produce and perhaps some sauces, we purchased dried peaches and pears. We're pulling our menus together now, and will post the entire document when it's complete. Every year, we start our paddling season by doing some training or an assessment. We do this in order to stay current as coaches and prepare ourselves for whatever might arise with students. 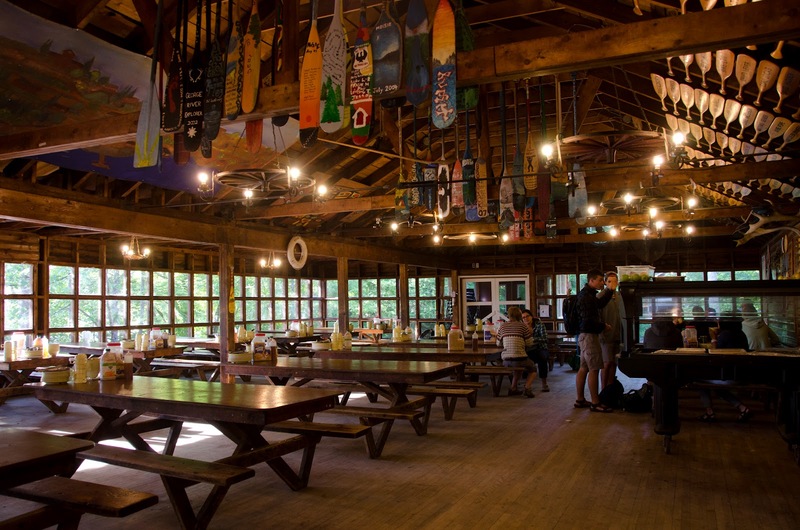 The dining hall at Camp Kandalore, where painted paddles represent campers who've completed a 30-day canoe trip. Alec just returned from Camp Kandalore in Ontario, where he completed completed the WAFA to WFR Bridge course to complete his Wilderness First Responder (WFR) certification. The training was provided by Matt Howell of Wilderness Medical Associates, Director of Missinaibi Headwaters Outfitters, an adventure touring company in Chapleau, Ontario. Matt Howell demonstrates methods of reducing a dislocated shoulder in the field. Obtaining a WFR certification is required for most backcountry guides, and it's invaluable for anyone venturing into the wilderness for an extended trip. It focuses on how to assess and care for patients suffering from a wide range of medical and trauma issues in remote places where emergency services may be days or weeks away. 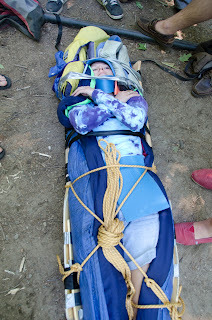 A litter made of canoe paddles, rope, camping gear and other available materials, designed to keep the patient's spine stable during an extraction over rough terrain. As we posted when Alec took the Advanced Wilderness First Aid course last fall, the curriculum covers risk management and prevention as well as assessment and management/treatment. It does so through readings, discussions and plenty of scenarios. The Bridge course builds on the body of knowledge in the WAFA course and qualifies participants to treat a greater range of conditions. 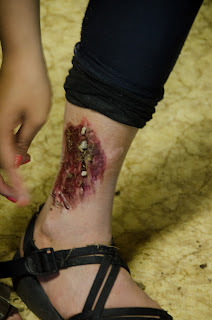 A gruesome wound, artfully created with stage makeup, gravel and twigs. It also emphasizes the risk/benefit considerations in every decision. For us, this is familiar territory. 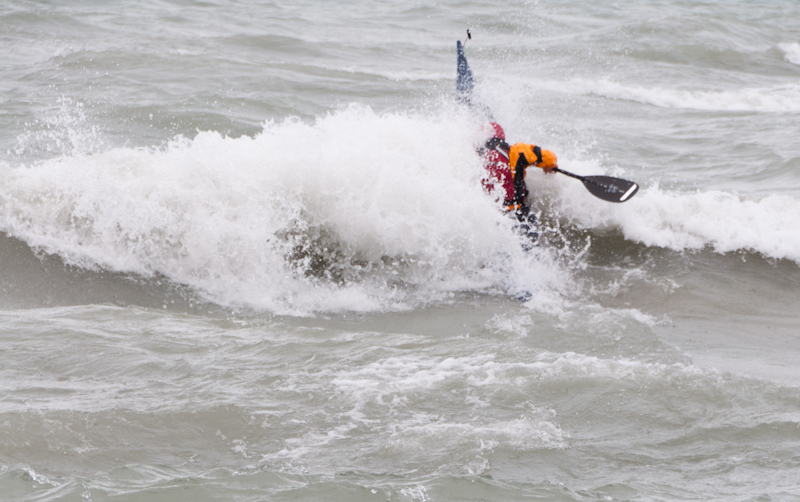 As paddlers and coaches, we are constantly assessing risks and rewards. Will running a particular drop be rewarding enough to be worth the risk? How great is that risk? And how serious are the consequences? And in rescues, we ask whether coming to the aid of one person puts others at risk. 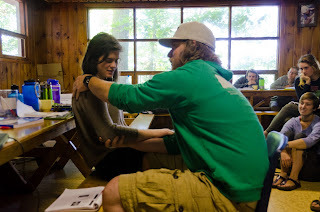 In wilderness medicine, rewarding is measured in terms of the patient's health. Will moving him increase his comfort or heighten the chance of injury to the patient, the rescuer and the group? Is the risk associated with administering pain medication worth the relief it provides? 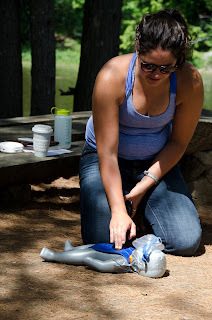 Infant CPR is part of the WFR remit. Wilderness Medical Associates calls the Wilderness First Responder course "the definitive wilderness course in medical training, leadership, and critical thinking for outdoor, low-resource, and remote professionals and leaders. "As we've seen over the six years that we've participated in WMA courses, they are constantly updating the curriculum to reflect new research and current best practices. The courses are rigorous and the knowledge essential. We've already put what we've learned into practice on several occasions, and we've been very glad to have it. 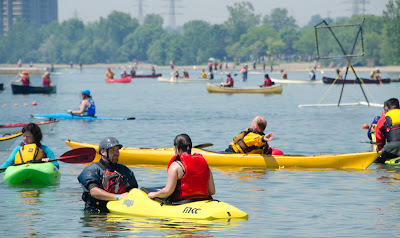 We just returned from MEC Paddlefest Toronto, an intense weekend celebration of canoeing, kayaking, stand up paddle boarding and other human-powered craft. It's hard to wrap your mind around all that goes on over the course of this two-day event. There are clinics on strokes, rolling, rescues and fitness; booths promoting manufacturers, trips, clubs and causes; boats and gear to demo or buy; and land classes on navigation, weather and boat repair. Boats, paddles, spray skirts and PFDs are provided, and it's all hands-on and helpful. ...and even learn how to fix a damaged hull. 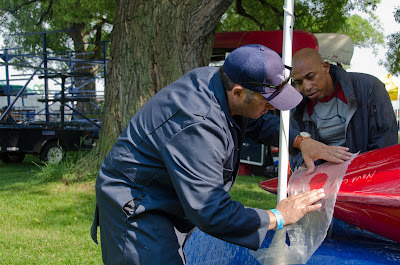 Here, Roch Prevost, sales and marketing manager of Nova Craft Canoe, demonstrates boat repair techniques. For participants, it's a fantastic deal. Courses cost $5 to $10 apiece, and there are lots of freebies (water bottles, Clif Bars, Larabars). The only way to measure attendance is in blue wristbands (which signify that participants have signed a liability waiver). This year, more than 1,500 wrist bands were dispensed. For us, it's an opportunity for cross-pollination of coaching ideas with colleagues in Paddle Canada. After a day of teaching, we spend the evenings talking shop with Erik Ogaard of Harbourfront Kayak and Canoe School, Michael Pardy of SKILS, Kelly Blades of P&H (not from Canada, but a fixture at this fest), David Johnston of Paddlinginstructor.com, and a host of other top-notch instructors from all over Canada. 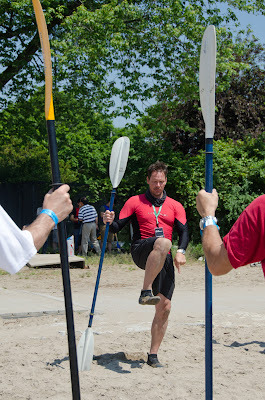 Erik Ogaard leads a paddling fitness class. 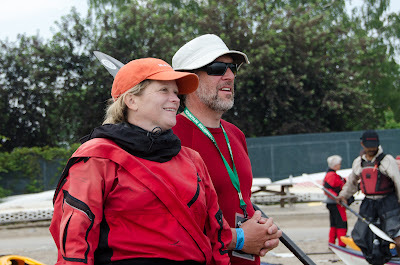 Dympna Hayes of Learntokayak.ca and Michael Pardy of SKILS evaluate strokes during a video analysis class. 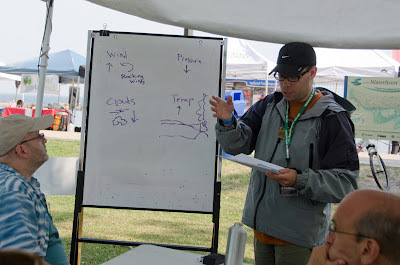 David Johnston teaches a weather class. Kelly Blades keeps it light. But it's more than that. It's also a chance to work with an extraordinarily diverse groups of students. 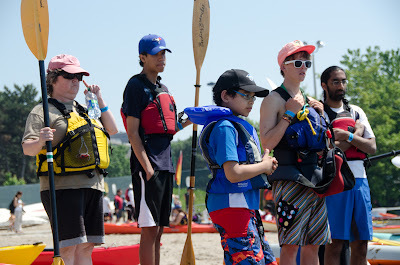 The range of ages and ethnicities at MEC Toronto Paddlefest is greater than at any other symposium where we've taught, and their determination and enthusiasm are inspiring. 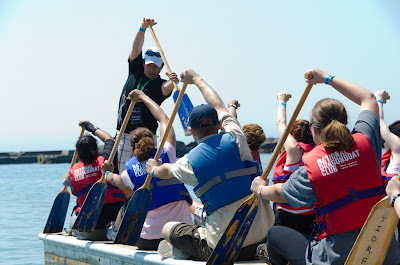 A dragonboat departs from the beach. 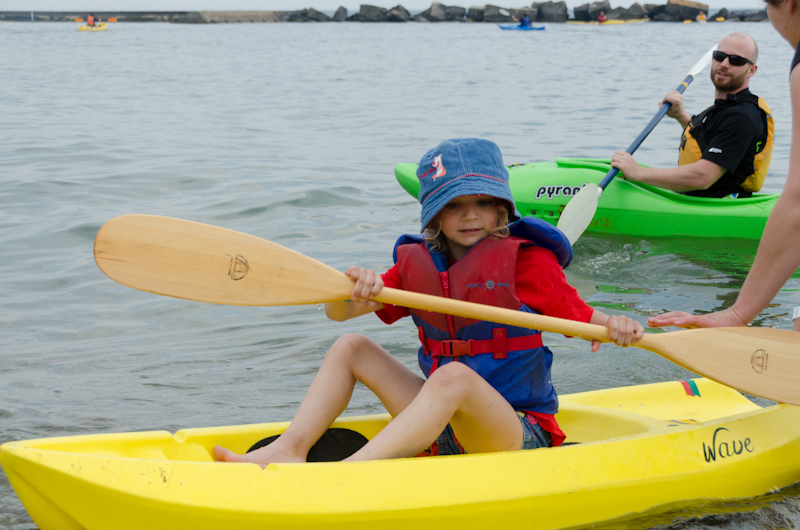 Even the tiniest paddlers could demo boats that fit. The range of participants is remarkable. At the start of class, many students are wobbly and uncertain; by the end they are sitting up straight and empowered. Whether they've learned to edge, made progress on a roll, figured out how to rescue a capsized paddler, or discovered how much they love to paddle, they are elated and appreciative. For a coach, that's the ultimate reward. 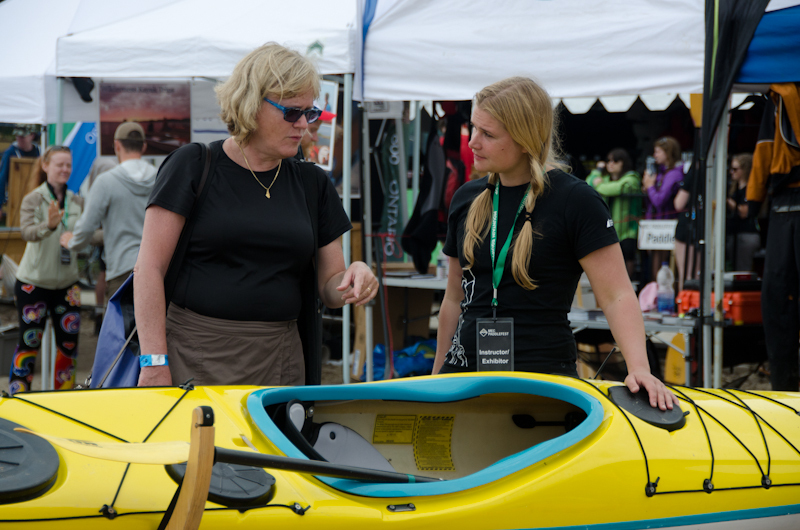 The MEC staff members are everywhere, registering students for classes, answering questions, locating needed gear, moving boats, and generally making the event run smoothly. 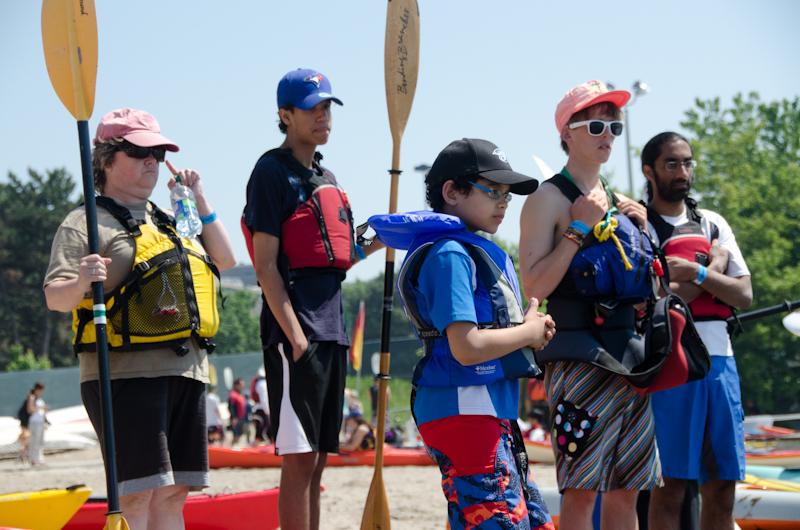 They're the magicians behind the curtain, fooling us into thinking it's no big deal to line a beach with upwards of 400 boats, paddles and PFDs; erect booths along the sidewalk; slap wristbands on more than 1,000 wrists; and troubleshoot the inevitable issues that arise during a weekend festival. On Sunday afternoon, when everyone else drove off to dinner, they were the ones who kept working until the wee hours of the morning. After loading 400 boats, MEC staff collected all the signage, boxed all the materials, and transported it all back to the store. It's a remarkable paddlefest in so many ways: size, organization and impact. We're already looking forward to returning next year. 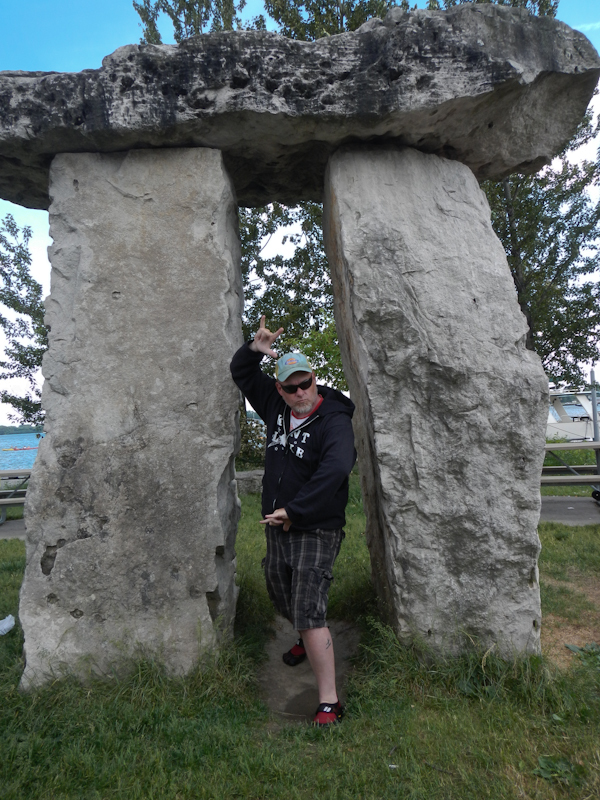 Alec prepares to do a reenter and roll. Early summer seems to be rescue season. Kayak clubs schedule rescue sessions, symposia offer rescue classes, and many paddlers take advantage of the now-warm-enough water to practice a few self- and assisted rescues. All of which is great; being able to get yourself and your buddies back in their boats is essential for safe paddling. But over the years, we've observed plenty of well-meaning instructors teach techniques that are not efficient, effective or particularly safe. 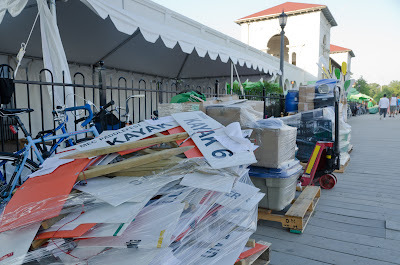 Troubled by this, we wrote stories for both Adventure Kayak and Sea Kayaker magazines on the T-rescue (the go-to assisted rescue) in which we explained current best practices. 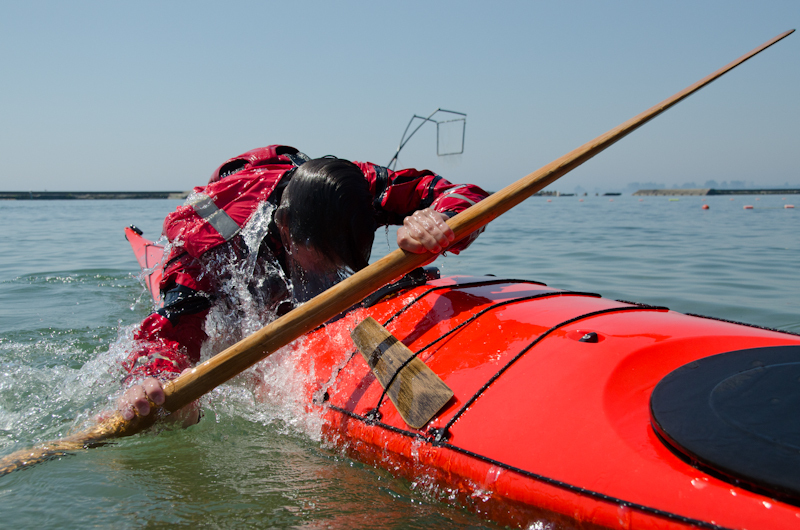 An image from our Sea Kayaker story, demonstrating how a victim can move safely from his boat to the rescuer's. Sending the victim to the stern of his boat. Failing to ask the victim to flip his own boat. Lifting the capsized boat in order to empty it. Allowing the victim to swim from boat to boat. Letting go of the victim's boat during the rescue. Placing the victim on the bow or stern of the rescuer's boat. Failing to hold on tightly as the victim reenters his boat. Each of these errors slows the rescue, increases the likelihood of injury, and diminishes the chances of success in all conditions. Encourage the victim to flip his boat. 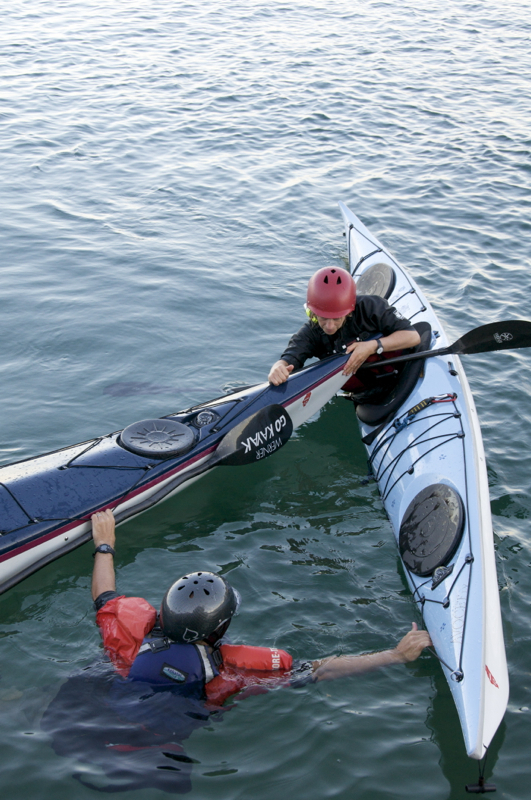 Have the victim transfer to the rescuer's boat, maintaining contact by holding deck lines. Keep the victim in front of or behind the rescuer's cockpit during the rescue. Roll the victim's boat over and then edge away to empty it. Hold tight on both sides of the victim's boat and lean on his deck as he reenters it. 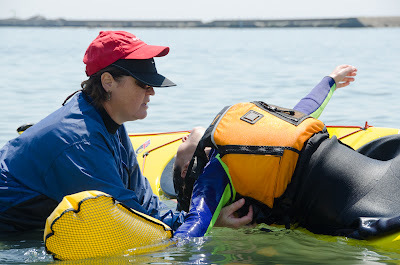 If the rescuer edges away from the victim's boat, she can empty it without straining her back or shoulders. 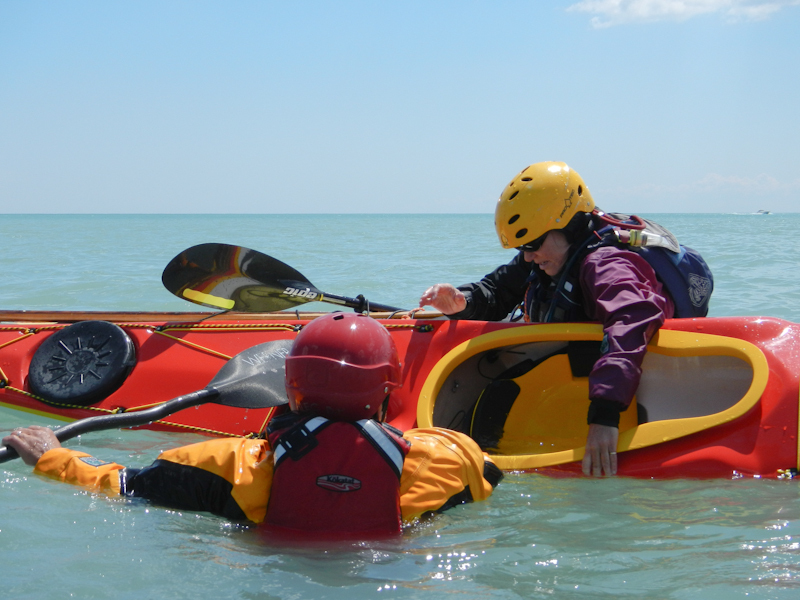 Most of the time, we see people teach and practice rescues on flat water. That's a good place to start, but it's essential to work on rescues on rough water, too. 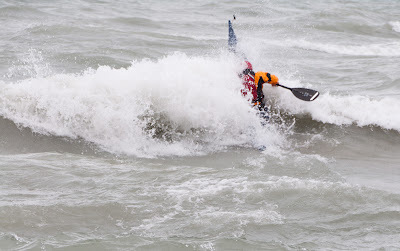 And in fact, plenty of techniques that work on flat water will fail in rougher conditions, which is where we are most likely to need them. Shawna Franklin and Leon Somme of Body Boat Blade International recently released a Sea Kayak Rescues DVD that covers assisted and self-rescues in flat, dynamic and rough water. There's no better way to demonstrate the importance of good technique than to see how well it works in a coastal environment with ocean current, breaking waves and rocky shorelines. 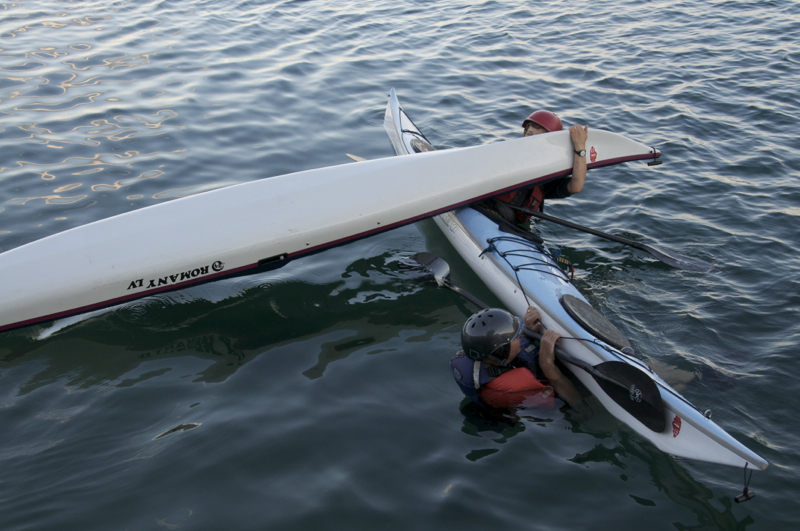 This instructional DVD does exactly that, showing how to quickly and safely return yourself or a capsized paddling partner to a boat. The demonstrations are done in real time and in real conditions. Because it's short (only 30 minutes), and favors action over talk -- and because it was shot by phenomenal filmmaker Bryan Smith of Reel Water Productions -- it's an exciting and compelling film (not the adjectives commonly associated with instructional DVDs). 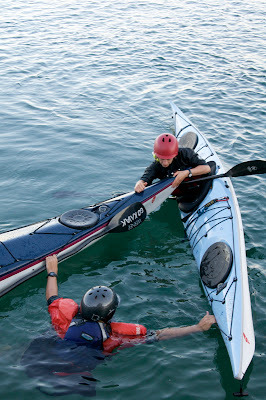 Sea Kayak Rescues costs $25 and can be ordered here. We are highlighting this one DVD because there are many books, articles and videos on sea kayak rescues, but all are not authoritative. 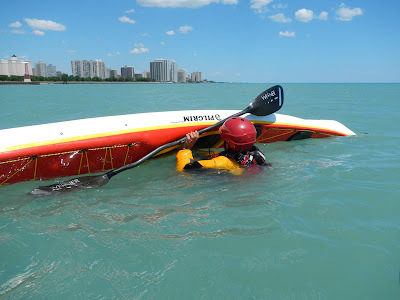 This one is, and we're convinced that if more people learned proper rescue techniques and then went out and practiced them, there would be fewer tragedies on the water. This is the season of changeable weather. And Lake Michigan is highly responsive to those changes. One day it feels like fall, with strong winds out of the north, big waves, abandoned beaches and a chill in the air; the next it feels like summer, with warm breezes, gentle waves, motorboats zooming and the beaches full of bathers. Yesterday we had the beach to ourselves. Today we worked on rescues with our friend Bonnie. 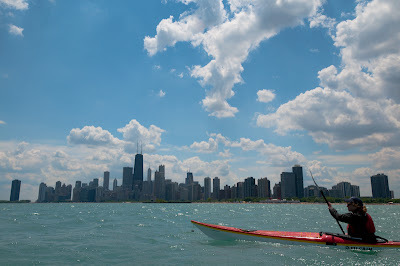 And paddled past skyscrapers, sailors, motor boaters and beach volley ball players. It would be easy to favor one type of day or the other, but we love both. 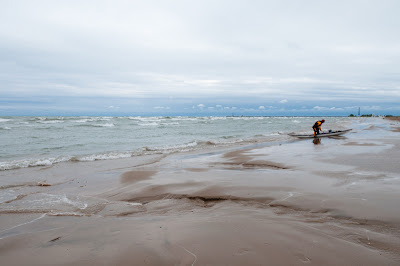 On rough-water days, we can surf waves and play in clapotis. On calmer days, we can practice rescues and paddle some distance. Both prepare us for the real range of situations we encounter over time, and both are fun.